Governor Sarah Palin (R-AK), right, is a hunter, fisherwoman, staunch religious conservative, wife, mother of five, and opposes abortion. She is quite a woman and now she is Senator John McCain's pick for vice president. Governor Palin is pretty standard for a Republican on environmental and energy issues. She was the Ethics Commissioner of the Alaska Gas and Oil Conservation Commission from 2003 to 2004. Palin passed into law a signature bill, called the Alaska Gasline Inducement Act, which dictates the way that the state accepted bids for its North Slope natural gas reserves. Her husband is a commercial fisherman, a seasonal oil production operator for BP on Alaska's North Slope and a member of the United Steelworkers Union. Yet this has not kept her from confronting Exxon Mobil, BP and ConocoPhillips. She pushed new oil taxes through the Alaska Legislature in 2006, which was strongly opposed by Exxon Mobil, BP PLC and ConocoPhillips. The new tax brought in an estimated $6 billion pushin Alaska's treasury to a surplus estimated at $9 billion. Palin then passed an initiative that gave each Alaskan $1,200 to help them cope with high energy costs. She's does not think humans are the cause of climate change but she will adjust this to match Senator McCain's leadership in Congress in promoting global warming mitigation. She has given the global warming serious consideration though by setting up an executive branch global waming office. On September 14, 2007, she signed Administrative Order 238, establishing the Climate Change Sub-Cabinet. The sub-cabinet is working to consolidate the state's knowledge about climate change in order to recommend policies and measures to guide the state's mitigation and adaptation efforts. She supports nuclear power, which makes her good on the global warming issue from a technological standpoint. There are no nuclear plants in Alaska, but McCain has the largest nuclear plant in the United States in Arizona (Palo Verde). Palin is a proponent of a natural gas pipeline from Alaska's North Slope. Palin supports mining in Bristol, which may disrupt salmon, bears, and caribou. Opposes a national windfall profits tax on oil companies. Said 'NO' to the bridge to nowhere proposed for Alaska. "The case for nuclear power to protect the climate and enhance security is purely rhetorical and cannot withstand analytic scrutiny. The supposed nuclear revival is a carefully manufactured illusion that seeks to become a self-fulfilling prophecy, yet it cannot actually occur in a market economy, as many energy-industry leaders privately acknowledge." "No environmental group of any consequence—only industry front groups—shares their views." Well AAEA is NOT an industry front group. We have been around for 23 years and have a rich history of environmental work. The quote is aimed directly at us because we are the only environmental group in the United States that supports nuclear power. He at least recognizes the four other people who support nuclear power, but these individuals, like Lovins, ignore AAEA's nuclear power work too. 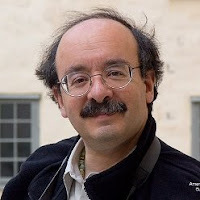 It is not unusual that Lovins would ignore us because the environmental movement is one of the most segregated and racist sectors of American society. AAEA has also documented the elite racism of the environmental movement. So we are not surprised by Lovins rendering us invisible. Clearly, many self-worshipping scientists emulate the example of James Watson and they are a dime a dozen. Maybe it is this feeling of superiority that explains why most environmental groups do not hire blacks in policy positions or hire just one to cover their general discrimination. Of course, Mr. Lovins must not think much of Congresswoman Eddie Bernice Johnson or the Congressional Black Caucus either. She is including us on her Science and Technology Braintrust at the CBC's annual conference this year. Lovins must think that Congresswoman Johnson has bad judgment. Moreover, AAEA's president organized the first energy forum in 1981 for the CBC for the late Congressman Mickey Leland. We could go on with our accomplishments but it will not matter to people like Lovins. We clearly are of no consequence to him and his ilk, but we provide a very valuable service to society in general and the African American community, which is excluded and ignored by the environmental movement. It is accurate to say that we are 'little known,' but saying we are of 'no consequence' appears to us to be an expression of one's opinion about the Black community. 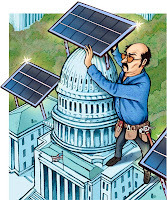 When Congress returns after labor day for a hyper three week session, energy legislation will be on the front burner. Although they could not pass a bill before the August recess, and some Republicans even stayed in town calling for members to return to pass a bill, Congress will probably merge the offshore oil drilling and green jobs components of the two bills described below that failed to pass. 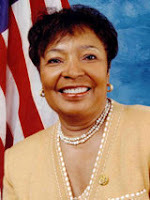 On September 26th, Congresswoman Johnson (D-TX), a long-time member of the House Science Committee, will host the Science and Technology Braintrust. The Braintrust is a panel discussion that is part of a larger event called the Congressional Black Caucus Foundation's Annual Legislative Conference. This year's Braintrust will focus on the technology of energy and environmental conservation. We will discuss sustainability from the academic-, corporate-, and federal perspectives as well as the education and skills needed for students of color to pursue careers in these areas. Event: Science & Technology Braintrust: How Science is Saving the Environment. A panel discussion on novel efforts to promote sustainability, and the science behind the efforts. Audience: Approximately 100. Many will be school children from the D.C. area, and there will also be federal agency officials, nonprofit leaders, and other policy leaders. Is nuclear energy a viable, cost-effective alternative to other generation methods? Will environmental justice concerns be addressed when planning, building and operating nuclear energy facilities? Under what circumstances will American embrace nuclear energy as an acceptable alternative to existing generation methods? Assuming a new generation of nuclear powered generating stations are built, does America have a sufficiently educated and trained workforce to build, operate and maintain such facilities in a safe, reliable fashion? The South Carolina Congressional delegation along with the governor and mayor the city have been invited to provide opening remarks. Panels include: The Nuclear Regulatory Process as a Function of Government, A Utility Industry Perspective on the Nuclear Regulatory Process, A Wall Street Perspective on the Financial Realities of Nuclear Energy, Disposal, Transportation and Storage of Radioactive Waste Material, 21st Century Technology and the Nuclear Energy Industry, The Community/Citizen Perspective on Nuclear Energy, Workforce Development for the Nuclear Energy Industry, and Energy and the Election. 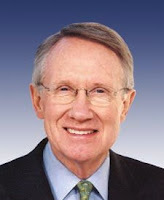 Senate Majority Leader Harry Reid, the Center for American Progress Action Fund and the University of Nevada, Las Vegas (UNLV) organized and held the National Clean Energy Summit this week at the Cox Pavilion at UNLV. The conference with politicians and energy experts is pushing for a future without a dependence on oil. Reid calls Nevada "the Saudi Arabia of renewable energy," and it has 57 operating renewable energy projects, which heat and cool 200,000 homes. Texas oilman-turned-windpower advocate T. Boone Pickens, New York City Mayor Michael Bloomberg, former Treasury Secretary Robert E. Rubin, Utah's Republican Gov. John Huntsman, and former President Bill Clinton, among others, spoke at the conference. Panel discussions included green jobs creation, improving efficiency for businesses, and government's role in encouraging a transition from fossil fuels. Two companies are planning to cover 12.5 square miles of central California with solar panels, which will generate about 800 megawatts of power, roughly equal to the size of a large coal-burning power plant or a small nuclear plant. 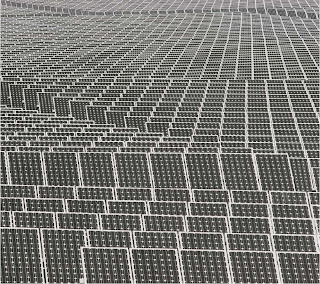 A megawatt is enough power to run a large Wal-Mart store or 1,000 homes. The power will be sold to Pacific Gas & Electric, which is under a state mandate to get 20 percent of its electricity from renewable sources by 2010. Though the California installations will generate 800 megawatts, they will operate for about a third of the time of a coal or nuclear plant and thus will produce about a third as much total electricity. It is also not dedicated power and there will always have to be backup power available because of cloudy days. And of course no power is produced at night. OptiSolar will install 550 megawatts in San Luis Obispo County. The SunPower Corporation will build about 250 megawatts at a different location in the same county. The companies are forbidden by contract terms to talk about price. 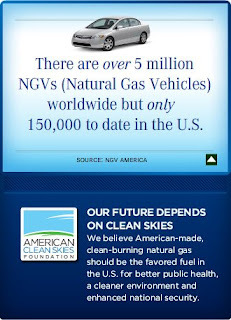 The American Clean Skies Foundation is running full page ads in major newspapers promoting natural gas. The foundation also includes their website: CleanSkies.org and their television show: CleanSkiesTV (part of the American Clean Skies Network). Must be nice. Those ads can cost hundreds of thousands of dollars for each one. Sure wish we could run ads like that promoting our agenda. We support their recommendation by the way. The ad shows a sign of gasoline prices and shows that natural gas prices would be half the price of petroleum based fuel. The ad states that Compressed Natural Gas (CNG) is an EPA-certified alternative fuel that can use the natural gas lines from your home to refuel. It shows the Honda Civic GX natural gas fueled vehicle. It notes that we spend $1.7 billion a day on imported oil and products. It ends by stating that CNG is clean, abundant, afrordable, american. Are they working with T. Boone Pickens or simply supplementing his effort? Because part of Picken's strategy is to 'back out' natural gas use at electricity power plants with wind turbines and utilize the 'avoided' natural gas in transportation vehicles. SmartBike DC is renting 120 bikes at 9 self-service racks in downtown Washington, DC, that includes Gallery Place, Shaw, Logan Circle, Farragut Square, Foggy Bottom, Reeves Center, Dupont Circle, Metro Center and Judiciary Square metrorail stations. The annual fee is $40 to get a membership card to rent a three-speed red bike for three hour intervals. Only those with a membership card can rent bikes. SmartBike members receive by mail the membership card, a safe-cycling guide, a pocket manual outlining the District's cycling laws and a bicycling map of the city. Riders have to provide their own locks and helmets and the replacement fee for a stolen or damaged bike is around $550. The District's program will be maintained by Clear Channel Outdoor and is part of a 20-year bus shelter contract. It appears that suicide victim Bruce E. Ivins was behind the anthrax attack on Washington, D.C's main post office. 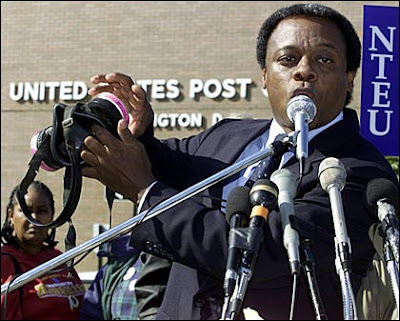 It is worth revisiting the 2001 situation because, although it is not being reported now, the postal workers at Brentwood felt abused by the reactions of the responsible policy decision-makers at the time. Most of the postal workers at Brentwood are African American. They felt that the response to their anthrax contamination was handled differently from the response at the Hart Senate Office Building. Brentwood remained open after anthrax was discovered and the Hart Building was immediately evacuated and closed after an anthrax letter was found in Senator Tom Daschle's office. Brentwood was later closed and employees worked out of a building nearby. Bruce Ivins, 62, is being described in the press as the prime suspect in the anthrax attacks. He was a biological-weapons specialist at the U.S. Army Medical Research Institute of Infectious Diseases at the Fort Detrick lab in Frederick, Maryland. He graduated from the University of Cincinnati with a Ph.D. in microbiology. He was described by his brother as being an egotist who thought he was omnipotent and "like a god." This idiot god evidently murdered Thomas Morris, Joseph Curseen and three other people with anthrax. Provide short‐term relief to American families facing pain at the pump by providing an "emergency energy rebate" that would give individual citizens $500 and families $1,000 to help them cope with high gas prices -- paid for by a "windfall profits tax" on oil companies. Put 1 million Plug‐In Hybrid cars –cars that can get up to 150 miles per gallon –on the road by 2015, cars that we will work to make sure are built here in America. Implement an economy‐wide cap‐and‐trade program to reduce greenhouse gas emissions 80 percent by 2050. A bipartisan group of 10 senators are cosponsoring New Energy Reform Act of 2008 in hopes of breaking the Senate deadlock on energy legislation. The legislation, which could be considered when Congress returns in September, includes limited offshore drilling with increased investment in new energy technologies. A portion of the finding for renewables would come from taking back tax breaks from the oil industry. The bill also sets a goal of fueling 85 percent of the country's automobiles with alternatives to oil within 20 years. The group, calling itself the "Gang of 10," is led by Senator Kent Conrad and includes five Democrats and five Republicans: Sens. Saxby Chambliss (R-Ga.), Kent Conrad (D-N.D.), Bob Corker (R-Tenn.), Lindsey Graham (R-S.C.), Johnny Isakson (R-Ga), Mary Landrieu (D-La. ), Blanche Lincoln (D-Ark. ), Ben Nelson (D-Neb. ), Mark Pryor (D-Ark. ), and John Thune (R-S.D.). The goal of the bill is to reduce our dependence on foreign oil.